Diamond, Newly remodeled! 6 Bedrooms, 4 Bath Private Pool and Spa Vacation Home Located 15 Minutes from Disney. Every room will amaze you with this professionally decorated and furnished for maximum guest comfort and enjoyment vacation home. Plenty of room for everyone. 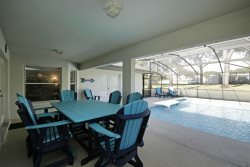 The pool deck is over sized with ample patio furniture and loungers. The patio has a conservation view. No rear neighbors! Liberty Village Community is a desirable vacation home location for families. Close to Walt Disney World, Disney Springs, grocery and Orlando outlet shopping. There are excellent restaurants to choose from nearby. Celebration, Disney’s planned Community and Old Town only minutes away. You can comfortably sleep 14 in this spacious home! Bedding :2 King Master Suites,4 Twin ,2 sets of bunk beds,day bed.The Diamond has a 4 bed sister home next door available. 2 Kings,4 Twins, 2 sets of Bunk beds, Day bed.